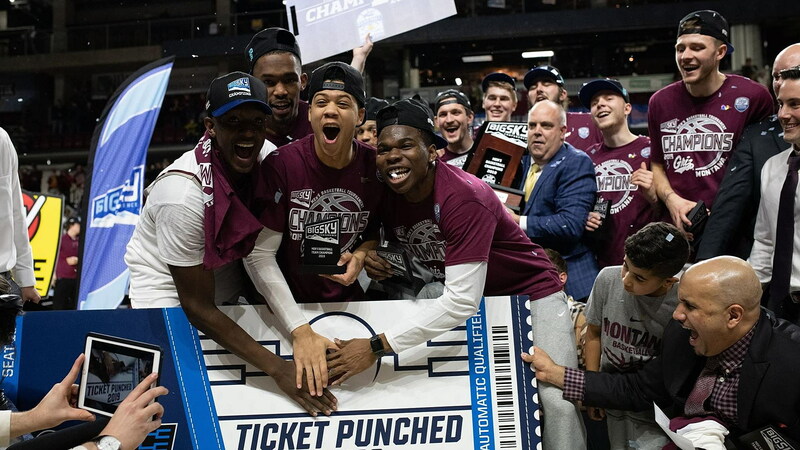 Montana is dancing once again: As they did in last year’s title game vs. Eastern Washington, the Grizzlies overcame a double-digit deficit on Saturday night to win the Big Sky tournament (68-62) and punch their ticket to March Madness. The tournament title is Montana’s 11th in school history, more than any other Big Sky program. The Grizzlies are the first program to repeat as champions since the 2012 and 2013 Grizzlies did so, and are the fifth school to ever win back-to-back regular-season titles and tournament championships. The Grizzlies will play in the NCAA tournament for the 12th time in school history and will learn their destination and first-round opponent Sunday afternoon. Eastern Washington came out of the gates hot, making seven of its first eight shot attempts and jumping out to a 17-5 lead. The Grizzlies were doubled up midway through the first half and trailed by as many as 12 points. Like they didn’t in 2018, when Montana overcame an 11-point halftime deficit to the Eagles, the Grizzlies never gave up, using a 10-0 run to get within two, 28-26. With the chance to tie or take the lead, Montana weltered down the stretch, though, missing its final five shot attempts of the first half. The Grizzlies trailed by as many as eight points in the second half, but then found its offensive rhythm, connecting on nine of 11 shot attempts at one point, including five in a row. They were able to flip the script, turning the eight-point deficit into an eight-point lead. Bobby Moorehead, who missed four of his first five shot attempts, connected on a big trey to get Montana to within a possession, 38-36. A few moments later, Ahmaad Rorie took over. The senior was scoreless in the first half before scoring 11 points in the second frame, including nine during Montana’s run. He connected on back-to-back possessions, the second pushing the score to 42-41. The two teams alternated baskets over the next several possessions before Moorehead’s defense resulted in a huge block, leading to a transition jumper for Rorie. Just like that, Montana had its first lead of the night (47-46 with 11:04 to play). Eastern Washington’s Jesse Hunt answered on the other end before Montana took the lead for good on a Donaven Dorsey three ball. The Grizzlies led by just two at that point, 50-48, but they wouldn’t trail again over the final 10:18. Dorsey took four shot – all three-pointers – and made all four. His fourth was the beginning of a 7-0 Griz run, turning a one-point advantage to eight. Montana qualified for the NCAA tournament for the 12th time in school history, including the second year in a row. Travis DeCuire is the third Griz coach to lead Montana to back-to-back NCAA tournaments. Montana was playing in its eight Big Sky tournament championship game in the past 10 seasons. Overall, the Grizzlies have won 11 tournament titles in their history – more than any other school – including two in a row. The Grizzlies became the first Big Sky school to repeat as tournament champions since Montana did so in 2012 and 2013. The Grizzlies are the fifth Big Sky school to ever repeat as Big Sky regular-season and tournament champions. Montana also did it in 1991 and 1992 and 2012 and 2013. No other school has done it since 1981. Montana improved to 26-8 on the season, tied with last year’s squad for the third-most wins ever in a single season. The team’s 52 wins over the past two seasons are a school record. Montana has won 89 games over the past four seasons, tied for the second-most ever by a senior class. Ahmaad Rorie was named the tournament MVP. In addition to his performance on Saturday, he scored 28 points in Montana’s semifinal win on Friday. Oguine – who had 12 points, seven rebounds, three assists, one block and one steal on Saturday – was also named to the all-tournament team. Rorie didn’t score in the first half but finished the night with 11 points, including nine during a 6-minute stretch. His ninth point gave Montana its first lead of the night. Sayeed Pridgett had a game-high 18 points (12 in the second half), in addition to three dimes. He had six points during Montana’s second-half run. Donaven Dorsey made all four of his shot attempts, finishing with 12 points on 4-for-4 shooting from deep. His first two came during Montana’s 10-0 run to cut the deficit in the first half. His third gave the Grizzlies the lead for good and his fourth came two possessions later, extending the lead. Montana shot 50.9 percent from the floor, including 45.0 percent from long range (9-of-20). The Grizzlies shot better than 60 percent from both in the second half, while holding the Eagles under 40 percent overall and 20 percent from deep. The Grizzlies uncharacteristically turned the ball over 10 times through the game’s first 14 minutes, but had just four turnovers over the final 26 minutes. The Griz defense altered shots all night, recording five blocked shots. Perhaps the biggest came on Rorie’s jumper to give Montana its first lead of the game. The transition bucket came off of a blocked shot by Bobby Moorehead. Moorehead played in his 133rd career game, setting a school record. Montana trailed for the first 29 minutes of the contest before taking its first lead at the 11:04 mark. Eastern Washington countered on the other end with a layup from Jesse Hunt but Dorsey nailed a huge three-pointer on Montana’s next possession to put the Grizzlies in front for good. Montana improved to 6-7 on the season when trailing at halftime. Montana knows it will be playing in the NCAA tournament next week, but will learn its first-round location and opponent Sunday at 4 p.m. during the NCAA Tournament Selection Show on CBS. Fans are invited to join the Grizzlies for a watch party at the Press Box.